Based out of Denver, Colorado, A.J. Machete & Sons offers bespoke, tailored menswear items of bygone eras through its Etsy store. While the suits are in the bespoke price range, their Etsy site does offer some more affordable garments and accessories that you may want to add to your existing swing dance wardrobe, such as custom vests, spats, cravats, and a 1930’s sports jacket. “First we get a rough idea of your measurements. You can measure yourself or a suit that you have. We would be glad to help you through this process and to mail you a cloth measuring tape, or, if you are in the Denver area, to measure you in person. But even the most perfect measurements do not guarantee a good fit. All of our bodies are different shapes and sizes, moreover, we have different postures. 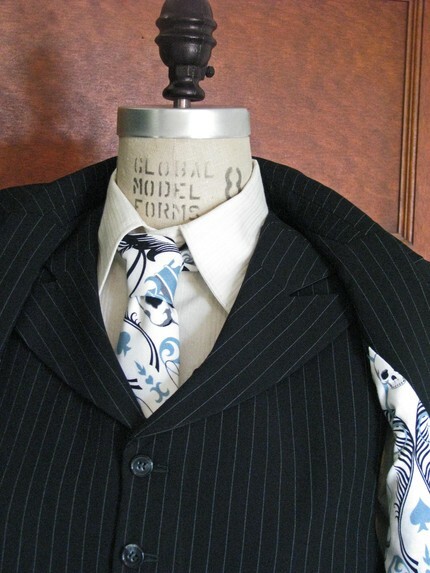 A suit made from measurements is no better than a ready-to-wear suit…. it is unlikely to fit every aspect of your body smoothly. To remedy this, we first make the suit from a rough cotton muslin fabric and send it to you for feedback and (digital) pics. Check out A.J. Machete & Sons’ blog, Denver Bespoke, for more examples of their handiwork.